Windows 10 is now active on more than 350 million devices around the world. We've given qualified customers the chance to experience the benefits of Windows 10 for themselves with our free upgrade offer. However, the Windows 10 free upgrade offer ends July 29th, 2016. Use this deadline as an opportunity to engage with each of your customers. Help them take advantage of the free upgrade offer to Windows 10 Pro before it's too late. It's easy to share the news. 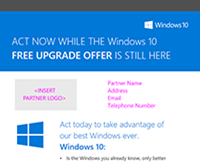 Download the customizable Windows 10 End of Free Upgrade Offer Thru-Partner Email Templates. Simply add your logo and company information, and your customer email is ready to go. Stay informed about Windows 10 news on the Windows for Your Business page. This is a mandatory service communication. You have received this message from Microsoft as a result of your participation in the Microsoft Partner Network (MPN). This message contains important information on your general membership, or your benefits as a member. If you would like to manage your contact preferences for non-MPN communications, visit the Promotional Communications Manager.